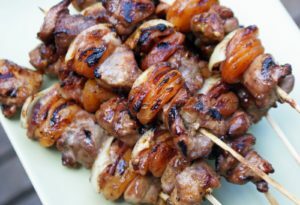 Delicious Boerewors & Apricot Sosaties are a must! Recently, the St. Marcus Team have been feeling a little experimental. We’re trying boerewors with absolutely everything and while peering at our sosatie counter, we thought why not try Boerewors & Apricot Sosaties! After preparing your Royco Marinade, let your mushrooms and apricots rest for 30 minutes. In the meantime, let your skewers soak in water for 20 minutes. Cut your boerewors into smaller chunks (whichever way takes your fancy) and start threading your ingredient onto the skewer; Boerewors. Apricot. Mushroom. And repeat! Place in an ovenproof dish and grill for 15 minutes. Good weather? Then throw them on the braai over cool coals. And there we go! It’s really as simple as that!